SCVHistory.com SC0502 | City of Santa Clarita | Children March in Holiday Parade, Frolick in Snow, 12-10-2005. Kate Wisdom, 7, of Saugus, joins her fellow Girl Scouts from Troop No. 426 during the Children's Holiday Parade on Saturday in downtown Newhall. Photo: Eddie Sadiwa/The Signal. A few more youngsters than expected showed up for the Children's Holiday Parade in downtown Newhall on Saturday morning — 600 more, to be precise. "I think we expected around 400 or so," said Councilwoman Laurene Weste. "We're so excited for the kids and for the community." 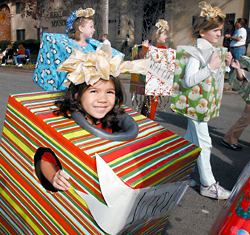 The event marked the first official Children's Holiday Parade, though it has been held on a much smaller level in previous years. City officials expressed a desire to see it become an annual event for the children and to highlight the downtown Newhall area. "One of our big areas is the downtown Newhall area and this is one way to get people down here to see what a great place this is," said Phil Ellis, chairman of the redevelopment committee. The parade was a collaborative effort between the city of Santa Clarita, the county and the redevelopment committee, Ellis said. Festivities included live entertainment, real snow, refreshments and a visit from Santa and Mrs. Claus. However, the highlight of the day was certainly the parade with more than 1000 youngsters dressing up to show off their "floats." The floats were loosely judged and prizes were distributed, but the event was designed in such a way that most of the kids received awards. "They can build their own little floats, dress up their bikes or wagons," Weste said. One boy, dressed up as Elvis paraded in front of all the parents and volunteers, while another dressed as Santa road his Christmas-themed bike. "This is one of the few places in the valley were you can do a parade and not impede traffic too much," Weste said. "It really is a lot of fun — we're loving it." Saturday's events were part of an entire weekend of festivities that began Friday night at the Veterans Memorial Plaza and will continue through Sunday. "All of this has a lot to do with the city's work with (the Newhall) Specific Plan," Weste said. The city hopes to develop an area that will draw people and show off the desirability of downtown Newhall, she said. "The city staff has really done a wonderful job," Weste added. "There are a lot of people here and I think they'll come back." sc0502: Download original images here.